A Marist is called to breathe Mary’s spirit, “to think, judge, feel and act as Mary in all things” The founder of the Society of Mary, Jean Claude Colin opened up the possibility of living a Marist way of life through a series of insights, expressions, images and symbols – Marist spirituality. Through it a person can enter into God’s plan of unconditional love for all people expressed in the incarnate Son of God, Jesus, who was born of Mary. To live the gospel in Mary’s way. The Apostles and Mary in the midst of the first Christians is a major reference point for Marists. We can think of Mary in this group of believers at the beginning: with her faith and wisdom she had much to contribute to the life of the church, but in an unobtrusive manner. Nazareth is another point of reference in Mary’s life and in the life of the first Marists. Nazareth is the place where in-a-sense Marist’s go in spirit and from there they are able to see things as Mary sees them. At Nazareth, Mary pondered and stored up in her heart, the events of the life of Jesus. For Marists, Nazareth is the place where slowly, silently, unobtrusively Jesus grew in wisdom and inner strength. Nazareth is also an approach to life to help Marists ‘ponder the things of God’ and treasure them in their hearts. It is a place of the heart: a place of gentle silence and faith. It is a place of growth. The phrase “hidden and unknown” is part of the fabric of what it means to be a Marist, it gives inspiration to Marists and is a type of motto. For Marists, being more or less “hidden and unknown” in the world, is a call to simple, modest and humble action. The focus on the task rather than who is doing it – it is a way being and doing. For Fr Colin, the founder of the Society of Mary, being, “hidden and unknown” was the only way to do good. Compassion, like love, longs for some real expression. It is by our compassionate service that people will see we are Jesus’ disciples and experience his love. When Marists are asked to become “instruments of divine mercy” they are being asked to portray this feature of God and they are to help build a Church which is perceived, not in terms of power, planning, control, administration and competitiveness, but rather in terms of community, compassion, simplicity, mercy and fellowship. For this reason Marists are to embrace and be welcoming to all, to the exclusion of no one, and to have an open heart to all. A useful way to describe the work of the Marist enterprise could be “to enable church to happen”. 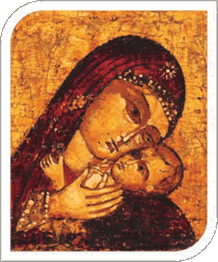 It is however, not just any church but one with the face of a woman, mother and disciple, reflecting mercy and compassion; a church which lives the Gospel after the manner of Mary.